Because of you, we are making progress. Take a look at what your donation has done. See all the videos we have uploaded so far. Thank you. Visit www.tapvideo.com click on link view all videos. 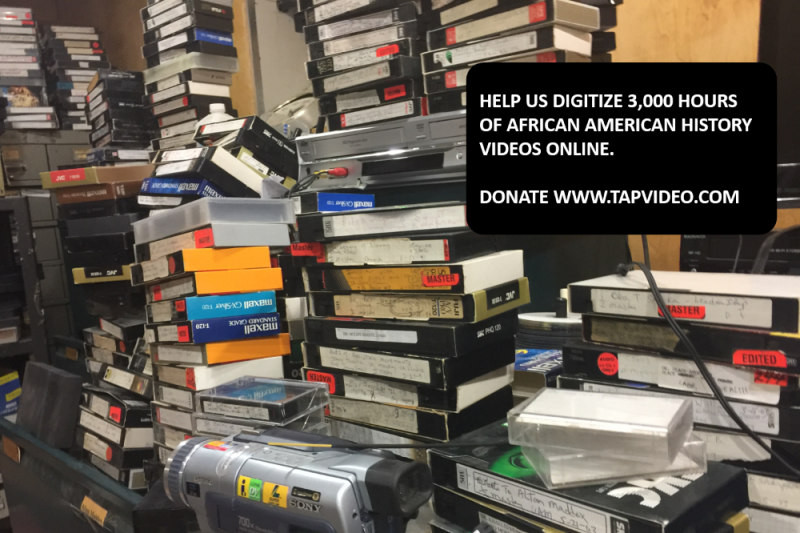 Support the upload of 30,000 hours of African American History. Thank you all for your donation. You are now part of a movement that will further the growth of the human race. Please continue to share. Thank you for donating. Please share. I AM BECAUSE WE ARE! !.....They may take out the revolutionaries but NEVER the revolution!! Carry on brother we are out here soaking up the information to be put in action. Big up my personal God,Mr Marcus Garvey! I will live the remaindered of my life, learning and living in truth. You're easily one of the most important people of our time Mr. Brown. Bringing people like me a kid born in Milwaukee, Wisconsin now living all the way in Los Angeles the word from the Master teachers themselves. This information is worth more than gold and it is exactly what I've been in search of my whole life, the answers to my all my questions and the real leaders/role models every young black boy needs. The key and foundation to a new mentality, new research, new learning, and new teaching for the youth. For our own, of our own, by our own, and for our own purpose. Thank you! I believe in Minister Brown’s mission and this is incredibly important history.